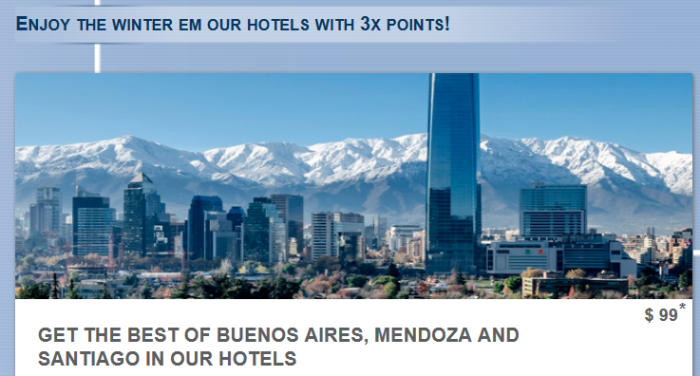 Le Club AccorHotels has launched new triple points offer for stays in Buenos Aires and Mendoza in Argentina and Santiago in Chile. The offer is valid for stays consumed between July 19 – September 19, 2016, and booked July 18 – August 18. Note that there is no minimum stay requirement beyond one night and you can earn the bonus points unlimited number of times. The offer doesn’t require you to book any other than points qualifying rate (some offers require you to book an inflated rate). I really like Santiago de Chile and usually visit the city several times a year. Mendoza is bit of a mess right now because airport closure due to repairs. 1. The terms and general conditions of Le Club Accorhotels apply to the offer winter Enjoy our hotels em 3x points! And you need to be a member of Le Club Accorhotels to benefit from it. 3. This offer is average for a stay of 07.19.2016 until 09.19.2016 in one of the hotels participantesque has been booked between 18.07.2016 and 08.18.2016. 5. Consecutive stays (check-out and check-in the same day) in the same hotel stays are considered simple. This simple stay will be eligible only once in the offer winter Enjoy our hotels em 3x points!. To enjoy the offer winter Enjoy our hotels em 3x points! You must sign it before booking.